On the afternoon of June 7th, Frank Mantlik found two EURASIAN COLLARED-DOVES at Sikorsky Airport in Stratford, CT. On the following day the birds were observed collecting nesting material and were seen copulating on the 9th. 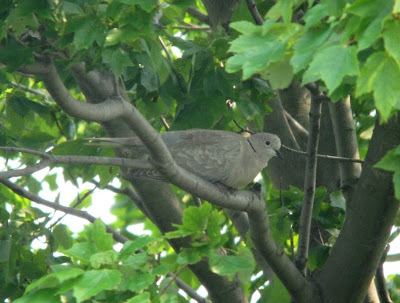 Keep in mind that this is ONLY the THIRD record of this species in CT, so a breeding pair has certainly caught everyone here off-guard, especially that they are not yet breeding within several hundred miles of the state. Given the species' incredible spread through the southern and western US, we've considered it a matter of time before breeding occurs in New England. But I don't think anyone was expecting quite this soon. This is, as far as I know, their first breeding attempt in New England. Quite an amazing turn of events. The question is, just how excited should we be? I admit that the initial report of EUCD did not have me running to Stratford, but the breeding attempt is fascinating. I was sure to get down there on the 9th to see them myself. 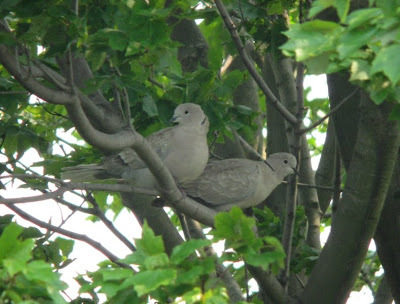 Despite the doves having spread throughout much of the south and west, there does not appear to be much hard data about their impacts on Mourning Doves or other native species. If anyone is aware of any studies out there, please let me know.